In every market where there’s a major change, there’s a tipping point when consumers decide they no longer want to buy into what is currently being offered – even if those offerings have been around for some time. The turf infill industry may be ready for its own tipping point. Greenplay and our founder, Domenic Carapella, were recently featured in an article on plant-based infill in the turf market for a publication called Athletic Business. If you haven’t had a chance to read the article yet, we would highly encourage you to check it out and see what the latest trend is in the synthetic turf market. The trade magazine is a must-read for individuals in colleges and universities, high schools, park and recreation departments, military branches and bases, health clubs, YMCAs, professional sports teams, stadiums and arenas, sports architecture firms, and hospital and corporate wellness centers. Overall, there are 40,000 subscribers of the magazine as well as tens of thousands visitors to its online site. Paul Steinbach wrote the piece, and he looked at the growing popularity of plant-based infill and why more readers of Athletic Business may be looking for alternatives to crumb rubber. The truth is that crumb rubber infill presents many issues. One infill supplier remarked how crumb rubber is hot, dusty, and smells. Plus, there have been some studies linking it to heat-related injuries and potential exposure to carcinogens. Yet, crumb rubber is still used on a great majority of synthetic turf fields. Some estimate that it could be as much as 12,000 fields. Sure, crumb rubber is cheap, but there are way too many negatives to justify the number of synthetic fields that still have turf infill. When Domenic Carapella was interviewed about plant-based turf infill, he was quick to point out that the market has grown exponentially in just three years. In the past 30 months, he said that Greenplay has supplied more than 60 fields. That’s significantly more than Carapella had supplied in the previous ten years. Carapella says the public wants alternatives and is driving the change towards natural infill. Greenplay’s organic infill is made from sustainable plant-based materials that offer customers the best overall safety options. Greenplay’s turf infill features comparable field temperatures to grass, low Gmax ratings to reduce the threat of significant injury, enhanced foot stability, low abrasion, and more. Although there is a long way to go before plant-based turf infill becomes the standard, the enthusiasm for alternatives to rubber crumb indicates we will eventually get there. It started with a vision of Greenwood Park, Henrico County, Va. becoming a sports complex so outstanding that it would attract athletic teams from all over the county as well as accommodate local schools. Voters overwhelmingly approved plans and were assured that their health and safety would be the fundamental factor when choosing what products to utilize. Due diligence began with research in order to select those products that would create the safest synthetic turf system for the athletic destination that would be Greenwood Park. It did not take long for a decisions to be made. Greenplay’s Corkonut® was chosen as the organic turf infill along with Brock’s PowerBase YSR pad to keep field surface temperatures low and to protect athletes from concussions and other sports related injuries. Greenplay’s Corkonut® is a proven blend of coconut fiber and cork that better integrates with the natural environment. It is successfully installed in well over 50 fields across the nation including these four new state-of-the-art synthetic turf fields now open at Greenwood Park. The Ultimate Cup soccer tournament was held on the opening weekend of February 24th and for some, it was a first-time amazing experience playing on a field with Corkonut. “The response to the Corkonut® infill at Greenwood Park has been nothing but positive. I spoke with a family on opening day after an elite-level soccer game, and the parents were thrilled. ‘Our daughter is a keeper and she didn’t get torn up.’ That’s why Henrico chose to go organic . . . player safety.” -Dawn Miller, Tourism Supervisor of Henrico County Division of Recreation and Parks. 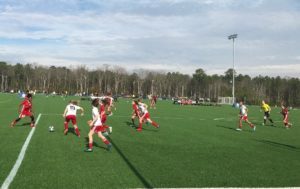 The vision Henrico County had for their community has become a successful reality as athletes and families from near and far are enjoying the safest state-of-the-art synthetic turf fields. It won’t be long before the local high schools each get their own new field installed with Greenplay’s Corkonut turf infill. Stay tuned. Public school districts, private schools and municipalities continue to choose to have synthetic turf installed; they need to make decisions on what products to utilize. There are different choices of infill available on the market today and going directly to the source with questions should be part of due diligence. Testing data and product specifications are important factors to determine the safest infill that best suits community need. Questions on maintenance should also be asked at the source to avoid misinformation. Greenplay’s Corkonut® infill is a proven choice of infill that is presently installed in over 50 fields across the country. It has been tested and proven to lower surface temperatures to within 20 degrees of natural grass. Greenplay has also been tested for toxicology, performance, durability and abrasion with outstanding results. All testing data is available upon request. Routine maintenance is required for all fields regardless of the choice of infill to ensure that the synthetic turf playing surface is free of debris or contaminants that can compromise the safety of the field as well as to raise the turf fibers with brushing to allow them to perform as designed. Seasonal maintenance is also required for all fields regardless of the infill utilized. It is important that the surface of the infill be uniformly flat and even across the field. 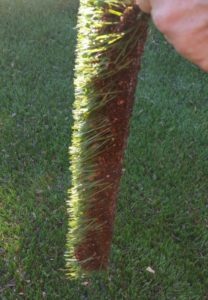 The height of the infill matters because too much free pile space can cause the turf fibers to lose support and become weakened. It may be necessary to add infill after some time to top off the field. With Greenplay, on average, about three percent of infill may need to be added per year. That’s it. ***Request testing data and samples, ask questions, visit our fields and compare them with any other. 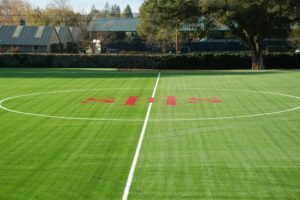 As the reliance on synthetic turf fields increases, the decision to utilize Greenplay® organic infill with the turf has become more common as school administrators, parents and athletes in general are voicing their common concerns for turf that is cooler, less abrasive and less of a mess from all of the typical particle fly-out. It is increasingly evident to all that synthetic turf installed with Greenplay® Corkonut® makes a tremendous difference. With over a decade of experience exclusive to organic infill, Greenplay Organics has perfected the 100% natural Corkonut® blend to be the proven absolute best-available, fully recyclable and safest artificial grass infill that provides the closest experience to playing on natural grass. Corkonut® is blended using an exclusive, natural process utilizing only select pesticide-free coconut fibers and high quality pure cork that is guaranteed to be environmentally friendly and human safe in every regard. How does it perform? Everyone who plays on it says it’s the best turf they have ever played on and there is a ton of test data that proves why. Is it stable? It is literally stable enough that if you could turn the field upside down almost none would fall out! It maintains stability throughout the field even during heavy play with little or no fly-out whatsoever. It is odorless and holds 150% of its weight in water that provides the absolute lowest turf temperatures as a result of a grass-like evaporative process. At a public meeting in Charlotte, North Carolina, discussion was under way for soccer field improvements at Bradford Park. Citizens were given the opportunity to ask questions and when someone asked what infill will be utilized county staff responded that the safer organic infill will be used. Corkonut® is now installed in 3 soccer fields at Bradford Park. Increased playability is a main reason to install a synthetic turf field. Additional opportunities for kids to be active are always a good thing. Due diligence leads municipalities, schools and universities to choose Greenplay® as the safest organic infill. IT is the natural solution for artificial turf. Visit www.greenplayusa.com to learn more. 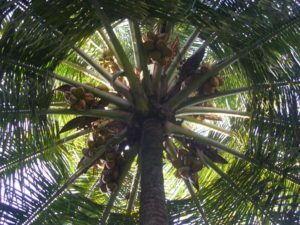 The coconut tree is known as a Tree of Life for its versatility. The saturated fat in coconut meat helps support the immune system, helps reduce the risk of heart disease and helps destroy pathogenic microorganisms. Coconut oil can be classified as a superfood and can even nourish your hair and skin! Did you know coconut water is a good source of fiber and electrolytes? Electrolytes regulate nerve and muscle function, and we all know, hydrates the body. We also all know that hydration is important while playing sports especially when playing on synthetic turf due to higher surface temperatures. In case you didn’t already know, coconut fibers are a main ingredient in Greenplay® organic infill. Coconut fiber is strongly hygroscopic and readily absorbs moisture. It slowly releases this moisture keeping turf temperatures low. The mandate at Greenplay® Organics is to improve the benefits of synthetic turf by introducing systems utilizing organics as the synthetic turf infill of choice to better integrate with the natural environment. As far as artificial grass infills go, you can’t get any closer to nature than this! The unique coconut fibers used in Greenplay® Corkonut® are specially sourced from our team partner growers. This food source material is pesticide free and retains moisture for longer periods of time. This means your artificial grass field will stay cooler longer. We have tapped into the coconut tree’s gifts through use of coconut fibers as part of Greenplay’s® natural, organic synthetic turf infill. When blended with our pure cork the result is an extremely stable sports surface rivaled only by natural grass. Consistency of play is maximized and fly out is virtually eliminated. Artificial turf continues to be the choice of most schools and municipalities. The utilizing of Greenplay® as the natural choice of infill is providing communities with safe synthetic turf fields that are closer to nature and promote healthy living. Thanks to the Tree of Life! More than ten years ago, NPR published an article about extreme temperatures on synthetic playing fields during warm and sunny days. The article referenced the research of a Columbia University scientist who looked at thermal images of New York City in an effort to figure out how trees could cool down urban neighborhoods during the middle of summer. In his research, he noticed that there were some hot spots that he assumed were rooftops. After visiting those hot spots, though, he discovered that a third of them were actually turf fields. Synthetic turf fields that have crumb rubber turf infill to cushion the turf may be a potential risk for increased turf temperatures. The NYC Health Department says that adverse health consequences, including dehydration, heat stroke, and thermal burns, can manifest when surface temperature is too high. The article focused on the need for alternatives to crumb rubber turf infill systems to reduce risk as crumb rubber allows for heat absorption that causes surface temperature to spike. There are a number of reasons why park and schools administrators might decide to construct a synthetic turf field. The upkeep is relatively minimal and turf fields can be used in a wide variety of environments. However, heat is a concern, which is why those in charge must put careful consideration into what kind of turf infill they use to cushion the turf and protect those who are using it. In 2015, Sports Lab USA performed a comprehensive lab study comparing temperatures between Greenplay® Corkonut® turf infill, crumb rubber infill, and natural grass. The researchers used sensors to record the surface temperature over the course of 3.5 hours. After 3.5 hours, the natural grass was the coolest at 141.9°F. Greenplay’s Corkonut® followed closely behind at 159.3°F. The crumb rubber infill system ended up being by far the hottest at 206.3°F. These results were recently validated on an actual field installation at the University of North Carolina at Wilmington in September of 2017 where the air temperature was in excess of 90°F. The temperature of an adjacent natural grass field measured 105°F and the temperature of the artificial turf field with Greenplay® measured only 116°F. Those looking for an infill system for their synthetic turf fields will find that natural and organic Greenplay® artificial grass infill more than meets the challenge of preventing extreme surface heat. Greenplay® infill ensures turf systems remain within 20°F of natural grass. In addition to that, Greenplay® turf infill features ideal Gmax ratings to reduce the risk of injury, is environmental sustainable, and is built to last. If you are looking for an alternative to traditional infill systems that can simply get too hot on warm sunny days, Greenplay® is the answer! Everyone knows how hot a synthetic turf field can get with rubber or plastic infill. As school districts and municipalities consider all aspects of safety, it is realized that EHRI (exertional heat-related illness) can be drastically reduced with a cooler field. This is why organic plant-based infill is growing in popularity. At Greenplay Organics, our organic infill for artificial turf allows for turf temperatures consistent within 20º F of natural grass. Recently, the Mendota School District chose Greenplay® organic infill, Corkonut®, a proven temperature reducing blend of coconut fibers and cork, after calling upon experts to determine what system best fit their needs to deliver ultimate turf performance and safety. Greenplay’s specially blended Corkonut® turf infill has been successfully utilized in over 50 fields to date making Greenplay® the most trusted source for organic turf infill. As word gets out, organic infill has become the choice for many school administrators, coaches, and parents who value safety, low turf temperatures, and overall durability. Greenplay® organic infill not only will help reduce the risk of concussions and EHRI; it is a sustainable choice that is odor-free, mold-resistant, and built to last. The players and staff at the Mendota School District were happy with their new turf system, and we know you will be too when you choose Greenplay® for your turf infill. Contact us today to learn more! When it comes to athletes, there are those who enjoy playing on grass and those who prefer turf. Thanks to Greenplay’s artificial grass infill, they can now have the best of both worlds. Greenplay is changing the landscape of sports... literally. As the leader in organic infill technology since 2006, Greenplay has developed naturally safe organic infill that has superior durability and moisture retention compared to other field surfaces. Greenplay’s technology has been developed in North America over the past decade and utilizes the highest-quality natural plant-based components that are tested and proven for performance. The first NCAA Division-I athletic facility to implement Greenplay’s artificial grass infill was the University of San Francisco and the USF baseball team unveiled its newly renovated Benedetti Diamond at Max Ulrich Field in April 2016. The Dons’ Benedetti Diamond leads with unique features in the latest synthetic turf baseball technology that include the Greenplay alternative infill system. The University of San Francisco is proud to feature eco-conscious Greenplay as the natural choice of alternative infill. Click here to learn more about Benedetti Diamond and the work Greenplay performed to aid its renovation. And here’s where you can see what other sports projects Greenplay has completed. When we think of what it takes to be a good athlete, a few words come to mind. Words like skill, practice, and determination usually come to the forefront before anything else. What else does a good athlete need to perform well? A good playing surface. An athlete’s field of play has a huge impact on their performance. From length of play to faster change-of-direction, and even safer conditions, the right playing surface can make a world of difference. No one understands that more than Greenplay®, an industry leader that has installed turf areas across the country with clean and safe organic infill. Greenplay® is the choice among school administrators, athletic directors, and, most importantly, parents who want a turf system that enhances player safety without diminishing player performance. Greenplay®s Corkonut® Infill and Pure Cork Infill exceed their expectations time and time again. Recently, Greenplay® was chosen by Henrico County Recreation and Parks of Virginia to provide the organic infill for its new artificial turf sports field complex, which would be positioned right in the center of the 88-acre park. In short, the project was the largest Henrico County Recreation and Parks managed in some time, so everything had to go as smoothly as possible, including choosing the right infill company. Citing safety and environmental concerns, the planners decided to go with Greenplay® organic infill. Greenplay®'s founder, Domenic Carapella, has been called the "Father" of organic turf infill, and he first introduced and championed his alternative plant-based specialty infill blends back in 2006. Greenplay® not only puts the nature back in turf, but it also supports all turf systems to ensure foot stability and low abrasion and maintain cooler surface temperatures; even on the hottest days, players are able to walk or run on the turf barefoot. The organizers of the project predict that the lifetime value for the park will be highly beneficial to the community. With the opening of this new multipurpose complex optimally located so close to the highway and hotels, the sports tourism and tournament opportunities are endless. The new park is set to open in time for spring soccer in 2018. Greenplay® is proud to have been a part of this project and looks forwards to hearing about the future success this park can bring to the town. To date, Greenplay® is now part of over 50 school, municipal, and university fields and will be installed in the three new Henrico County High Schools that will be completed early next year. Greenplay® is dedicated to bringing the best organic infill for artificial turf systems to the next generation of athletes.